The question was whether such evidence could also be found in the Ethiopian floriculture sector, where gender interventions took place since 2014 by the Ethiopian Horticulture Producers and Exporters Association (EHPEA) and the Business for Social Responsibility (BSR), supported by IDH, The Sustainable Trade Initiative and the Floriculture Sustainability Initiative (FSI). Therefore IDH decided to commission a study in the Ethiopian flower sector, co-funded by ICCO, to test the hypothesis that Gender interventions (e.g. 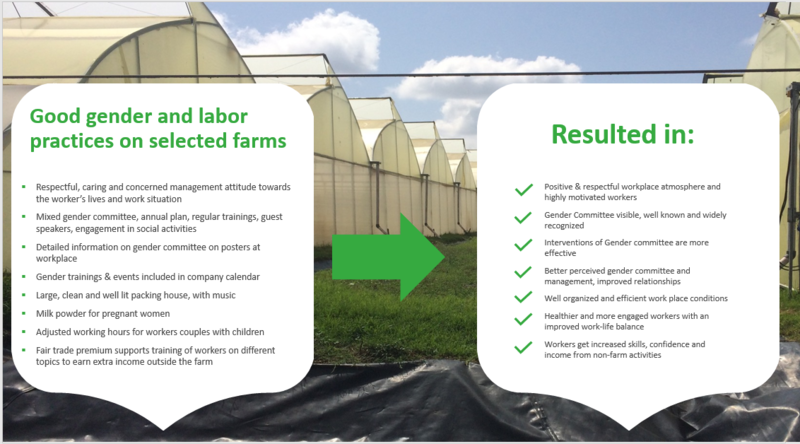 inclusive policies and practices) increase workers’ satisfaction and engagement (for women and men) and lead to changes in employee attitudes, behavior and work motivation, which leads to improved business performance of flower farms. Jochem Schneemann (teamleader) : “Based on our strong track record in Gender and value chains, IDH selected Fair & Sustainable Consulting (Netherlands) and Fair & Sustainable Ethiopia to conduct the study. We started preparations in February, and visited five farms in Ethiopia in May 2018. Our mixed team consisted of: Hibiete Tesfaye, Ayalew Abebe, Jingwei Ling and myself”. The gender interventions by the EHPEA projects were found relevant and effective, as shown by the outcomes of the Most Significant Change method used by the F&S consultant team (see the quotes at the bottom). The good practices of the five farms leading to improved business performance were documented and serve for learning and sharing in the sector and even beyond. Those are summarized in the figure below. We are grateful to IDH for the opportunity offered to us, and we are glad that IDH has published the results of the study in multiple ways: in an infographic (1 pager), a slide deck as well as the full report – for those interested in the details.